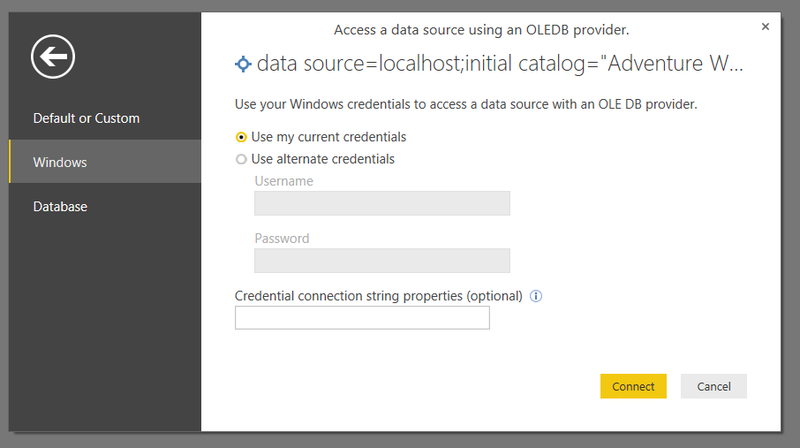 As well as ODBC connections, we can now use OLEDB and ADO.NET data sources – although they aren’t shown in the UI yet. And you know what this means… with an OLEDB connection we can now run our own MDX and DAX queries against SSAS data sources! I assume this will be coming in Power Query in Excel soon too. …neither of which were particularly satisfying. A lot of businesses just don’t feel comfortable with the cloud yet, and more importantly a lot of businesses can’t put their most valuable data in the cloud for a variety of legal and regulatory reasons. Today’s announcement of a deal between Microsoft and Pyramid Analytics is big news because it means Microsoft have got a credible answer to the Power-BI-on-premises question at last. For details, read the blog posts here and here, if you haven’t already, plus the Pyramid press release and this page on the Pyramid site. It’s not a perfect solution – I had been hoping that Microsoft would unveil an on-prem Power BI server that they had been working on in secret – but it’s a lot better than what we had before. It also ties up nicely with existing on-premises SQL BI investments that customers may have, and does so without a cumbersome SharePoint dependency. Pyramid Analytics … today announced a strategic collaboration with Microsoft consisting of development collaboration and technology integration. The output of this new collaboration is a range of new features in the Power BI Desktop at expected General Availability on July 24. 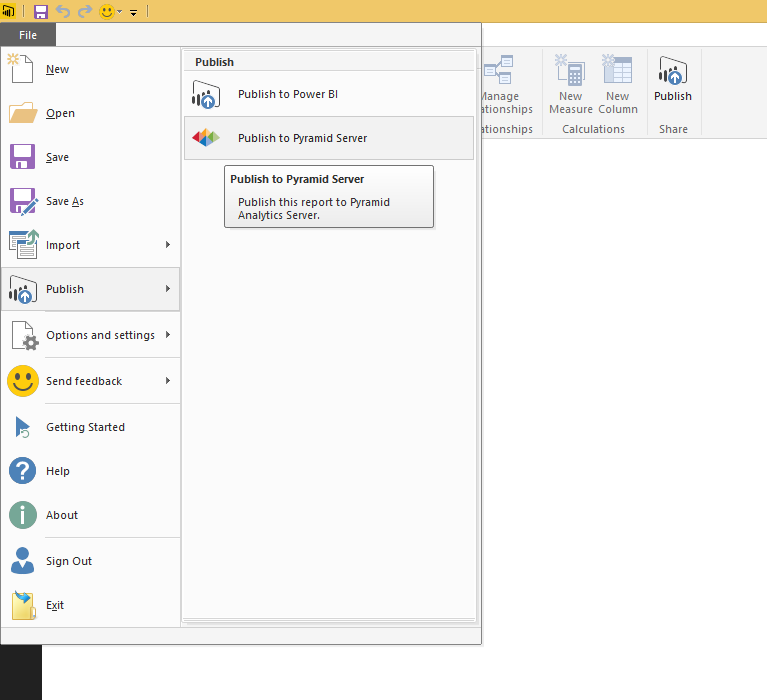 Among those features will be an option to publish a Power BI Desktop file to Pyramid Analytics Server. 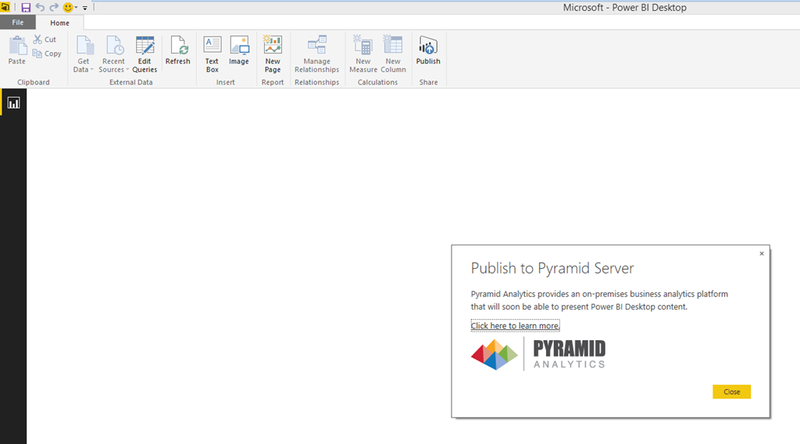 This feature will enable an ease of integration between the Power BI Desktop and the Pyramid Analytics Server. Obviously this is great news for Pyramid and I’m sure it will be a big boost for their business. They are certainly one of the leading third party client tools for SSAS and, I guess, the one with the biggest presence worldwide. Many of my customers are also customers of theirs, and I’ve always been impressed with their products. It’s interesting that this is a partnership rather than an acquisition… maybe, given the large number of ex-Proclarity guys at Pyramid, they had no desire to see history repeat itself? For Microsoft, I think it’s the best possible solution in the circumstances. Ever since the Power BI reboot last year, Microsoft’s BI strategy has become a lot more pragmatic – something that I, and pretty much the whole of the Microsoft BI community, have welcomed. Rather than pursue a grandiose strategy that fails on the details, the new focus is now on [shock!] building a product that people not only want to buy, but can buy easily. Some compromises have had to be made based on the position that Microsoft has found itself in, though. I guess with all the resources that are being thrown at Power BI V2, plus the development effort that is going into on-premises BI features in SQL Server 2016, it proved easier to partner with a third party vendor that already has a mature product and spare development resources, than build something from scratch. There are some downsides to all this, though. First of all, I feel sorry for the third-party client tool vendors that aren’t Pyramid, who must be feeling hard done by right now. That’s business, I suppose. Second, Pyramid’s on-premises solution is yet another dashboarding/reporting component that must be understood and fitted in to the Microsoft BI story along with Power BI Desktop, Excel, Reporting Services, Datazen, PerformancePoint (RIP), Excel Services and so on, making the Microsoft BI pro’s life even harder still. Similarly, the Pyramid brand is likely to confuse customers who really just want to buy a single, Microsoft-branded solution (and don’t get me started on the whole Power BI/Cortana Analytics Suite branding overlap thing either). Overall, I’m very happy as a result of this news. What with this, and the RTM of Power BI v2 tomorrow, Microsoft is back as a serious contender in BI both on-premises and in the cloud, and is catching up with the competition incredibly quickly. My blog post from earlier this year about bidirectional relationships and many-to-many in Power BI sparked a lot of interest. 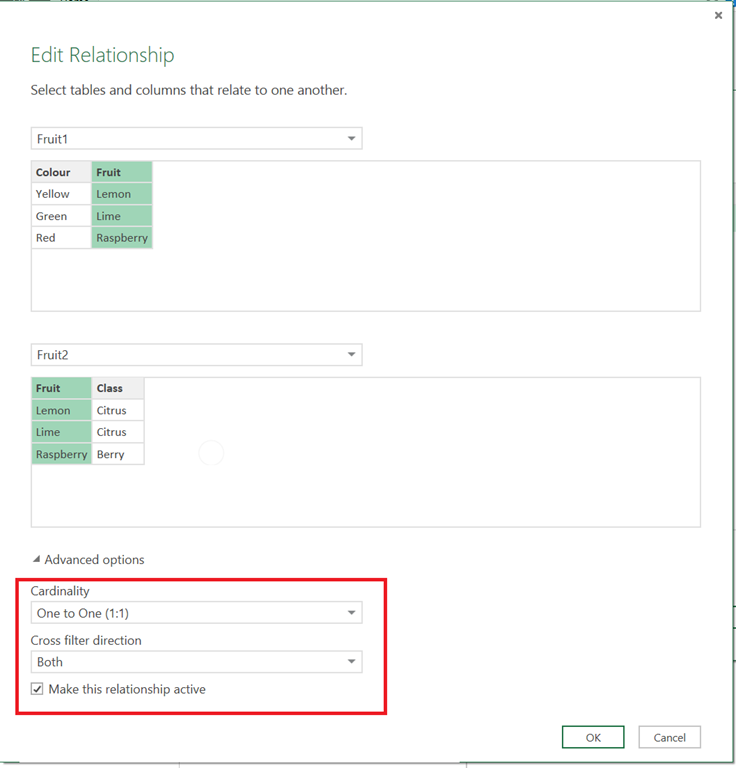 What I didn’t realise at the time is that there’s another new feature (albeit rather less exciting) concerning relationships: you can now create one-to-one relationships between tables. …then not only do you get bi-directional cross-filtering (ie if I select something from Fruit1 it will filter the Fruit2 table, and if I select something from Fruit2 it will filter Fruit1) but the Related() and RelatedTable() functions can be used in a DAX calculated column on either table to look up values in the other. With one-to-many relationships, you can only use Related() in a calculated column on the ‘many’ side of the relationship and RelatedTable() on the ‘one’ side of the relationship. Thanks to Marius Dumitru for pointing this out to me! There has been another flurry of Power BI announcements in the last few days in preparation for RTM on July 24th; you can read about them here if you haven’t already. There’s no point me repeating them all, but in amongst the major features announced there was one thing that I thought was worth highlighting and which could easily get overlooked. It is that by RTM the Power BI Desktop app will be able to connect direct to SSAS Tabular – that’s to say, you will be able to use it as a client tool for SSAS Tabular in the same way you can use Excel and any number of third party products. The Power BI Desktop app was previously known as the Power BI Designer – the name change was a wise move, because it is in fact a full featured desktop BI tool in itself, and not just a ‘designer’ for the cloud based Power BI service. It is a free download and you can use it without any kind of Power BI subscription at all. Therefore even if you are a traditional corporate BI shop that uses SSAS Tabular and you aren’t interested in any kind of self-service BI at all, you could use it just as a client for SSAS and forget about its other capabilities. Showing off the capabilities of Power BI Desktop will make selling a SSAS Tabular-based solution much easier, because those visualisations will make a much better first impression on users, even if they do end up using Excel for most of their work. Less capable users, or those without existing Excel skills, will appreciate the simplicity of Power BI Desktop compared to Excel as a client tool. Some users will need those advanced data visualisation capabilities if they are building reports and dashboards for other people – especially if those people expect to see something flashy and beautiful rather than a typically unexciting, practical Excel report. If your users are stuck on Excel 2007 (or an earlier version) and aren’t likely to upgrade soon, giving them the Power BI Desktop app instead will give them access to a modern BI tool. Excel 2007 is an OK client for SSAS but is missing some features, notably slicers, that Excel 2010 and 2013 have and that are also present in Power BI Desktop. Similarly, if your users are expecting to do a mixture of corporate BI using SSAS Tabular as a data source, and self-service BI, but face the usual problems with Excel versions, editions and bitness that prevent them from using the power-add-ins in Excel, then standardising on Power BI Desktop instead could make sense. 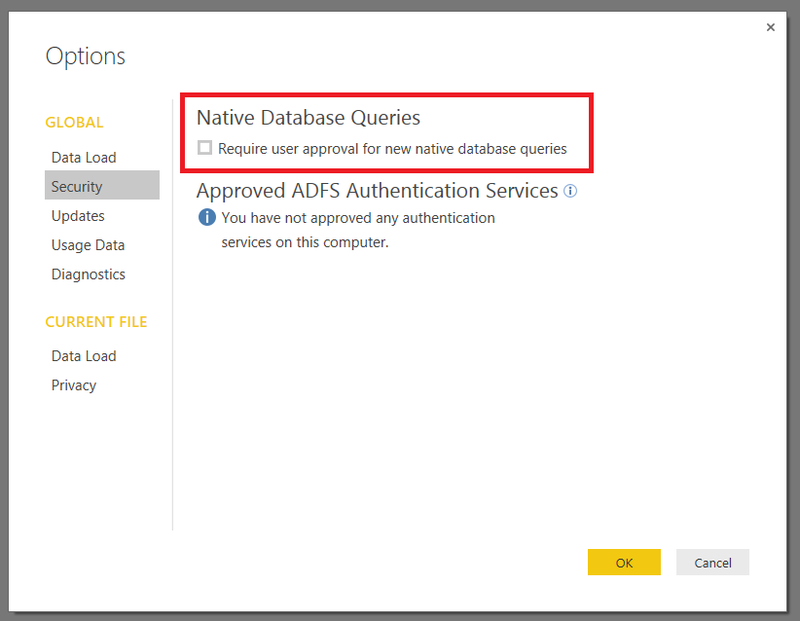 If you do have a Power BI subscription and can work with the requirements for setting up direct connection from PowerBI.com to an on-prem SSAS Tabular instance, then publishing from Power BI Desktop to PowerBI.com will be very easy. If you need to see reports and dashboards in a browser or on a mobile device, it could be a more attractive option than going down the Excel->SharePoint/Excel Services or Excel->OneDrive->PowerBI.com route. In short, I don’t see Power BI Desktop as a replacement for Excel as a SSAS Tabular client tool but as a useful companion to it. The last question that needs to be asked here is: what does this mean for third party SSAS client tool vendors like Pyramid Analytics and XLCubed? I don’t think these companies have too much to worry about, to be honest. These vendors have been competing with a less feature-rich, but effectively free, Microsoft option for a long time now. While Power BI Desktop erodes their advantage to a certain extent, they have a lot of other features besides visualisations that Microsoft will never probably provide and which justify their price. Besides that, the fact that Power BI doesn’t support direct connections to SSAS Multidimensional (yet…? ever…?) excludes at least 80% of the SSAS installations out there. 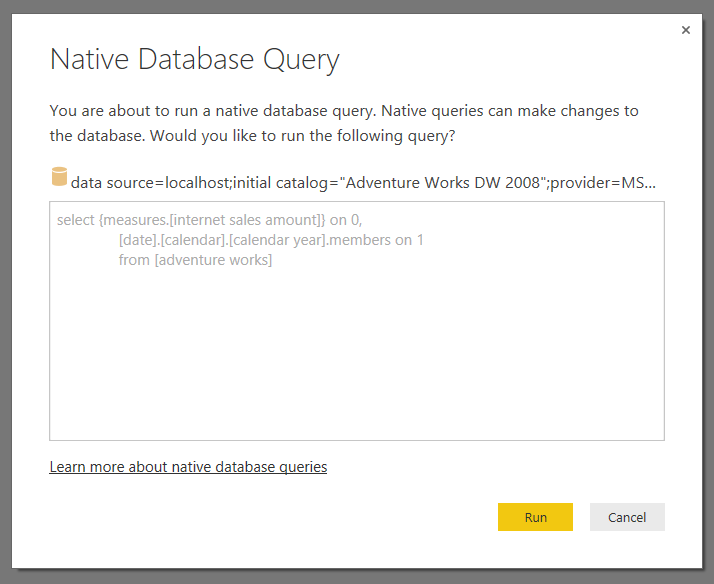 Disappearing or renamed columns in your data source can cause all kinds of problems when you’re importing data using Power Query: errors when you try to refresh the query, broken calculations in Power Pivot, PivotTables that reformat themselves and then need to be manually recreated. As a result, it can be a very good idea to build some logic into your Power Query queries that ensures that a table always contains the columns you’re expecting. Append the second table onto the end of the first table. 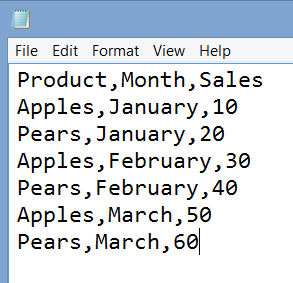 This will result in a table that contains all of the columns from both tables. 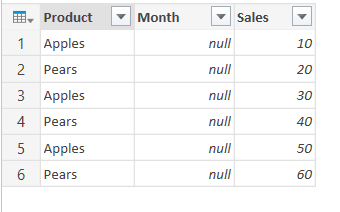 The point here is that even though the Month column only contains nulls, and the actual month names have been lost, the fact that the columns are all correct means that you won’t get any errors downstream and your PivotTables won’t be reformatted etc. Once you’ve fixed the problem in the source data and refreshed your queries, everything will go back to normal.